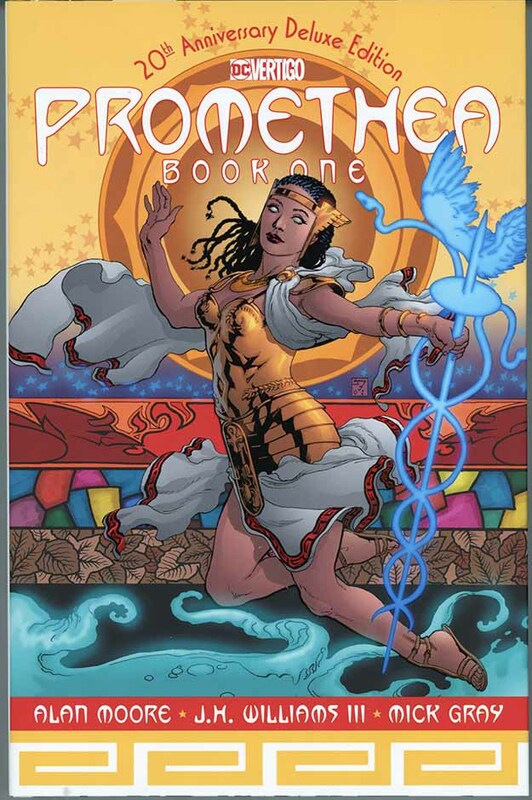 This is the fourth version of the collected first twelve issues of PROMETHEA. First there were the original hardcovers, Books 1 and 2. Then there were the original trade paperbacks, Books 1 and 2. Then there was ABSOLUTE PROMETHEA BOOK ONE, now this Deluxe Edition. As the designer of the original hardcovers and softcovers, I have to say I still prefer the design work on those, but since DC has decided to remove all traces of the America’s Best Comics brand, which I used throughout, I can see why they haven’t used my designs. Putting the first twelve issues into one book makes good sense, as was done for the Absolute editions, I like that. The Absolutes are much larger and on better paper, I can’t imagine how you could get better reproduction of the material, so that’s my favorite version, despite some redesigning inside. At least J.H. Williams III and I designed the covers and slipcases together. The new hardcover is in the Deluxe format, meaning it’s larger than the original collections, but not by a lot, and definitely smaller than the Absolutes. The paper quality is better than the originals, very white, but not as thick as the Absolutes, and the book is glue-bound rather than sewn. It’s still a nice package, though I don’t like the design work much. At least they brought back the brief introductory poems/text that ran before each issue in the first versions. I wrote most of those. There’s even one on the back cover. The front cover looks pretty good to me, but it takes the art from the Book 2 softcover and changes it, something J.H. would probably not be happy with. The additional material includes Alan’s script for issue #3, which is something I’m sure he wouldn’t be happy with. In all, I’m glad to see the material continue to be made available in a handsome edition. It’s a terrific series. Retail price is $49.99, hefty, but half that of the Absolute Edition, which is probably long out of print, so not a bad way to go if you missed that. Should be out soon, if it isn’t already. This entry was posted in Incoming on February 6, 2019 by Todd.